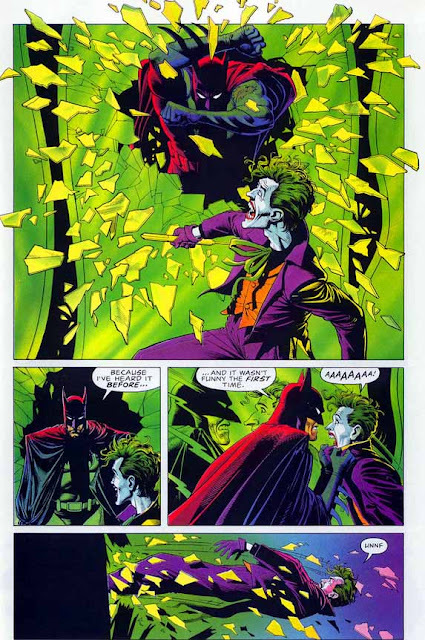 Ian U: The original idea for this article was going to be the ‘Top Ten Greatest Comics Panels Ever’, but after nearly two weeks it was obviously becoming a list of best moments from Dark Knight Returns with a few random 2000AD panels thrown in! So I had a bit of a re-think and came up with (hopefully) the first of a new ongoing series of Top Ten Comics Moments (! ), each one themed around a different character or creator. And who better to kick things off than the Dark Knight himself……. 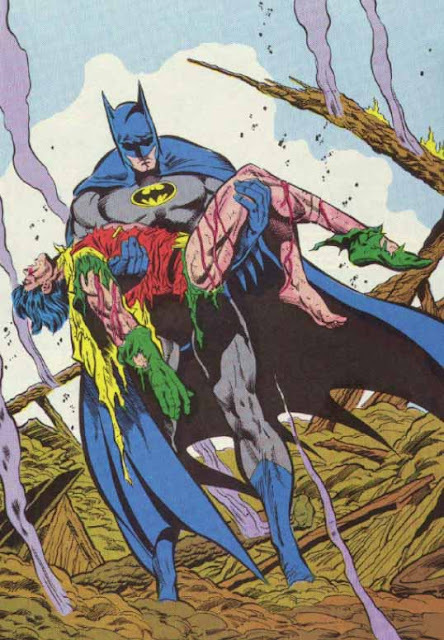 A classic moment from the Giffen/McGuire Justice League run as well as a classic Batman moment. 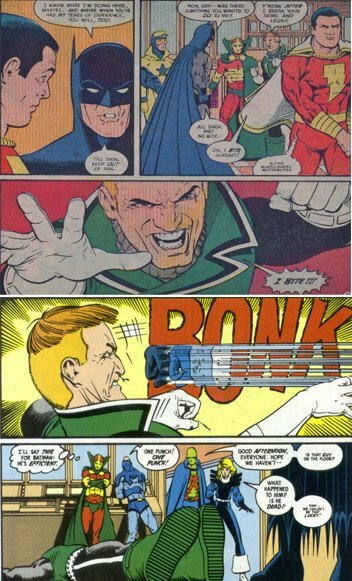 From the very start of the first issue Guy Gardner had been pushing for leadership of the newly formed JLI and resented Batman for the way everyone else looked up to him. Finally he snapped and threw a punch at the Caped Crusader, which any five year-old could tell you is a big mistake! Batman lays him out cold with one punch and walks away. 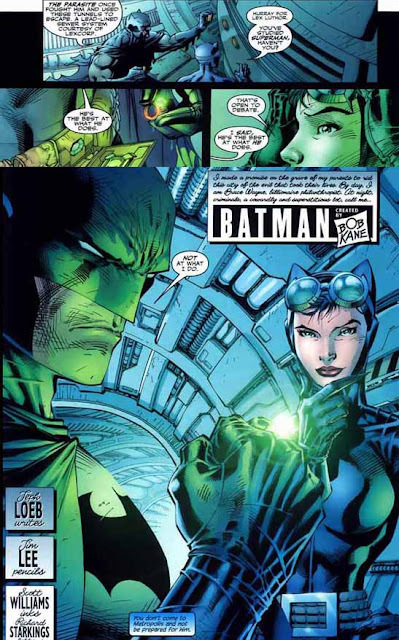 It’s obviously a moment that struck a chord with many people as Geoff Johns referenced it 20 years later in Green Lantern:Rebirth when Hal Jordan lays Batman out with a single punch, much to Guy’s amusement….. Broken and beaten - both physically and psychologically - by mysterious sewer-dwelling shaman Deacon Blackfire, the Batman had fled Gotham, vowing never to return. But this is comics, right? When does never actually mean never?! After a visit to a hospital bound Commissioner Gordon, Batman decides to return and reclaim his city. Obviously he wants to even the odds a bit so he does what any self-respecting vigilante would do: he turns the Batmobile into a monster truck and gets tooled up (although being Batman it’s only with tranq darts)!! And then, knowing what a superstitious and cowardly lot criminals are, he picks one of the Deacon’s followers to put the fear of God into and take a message to his master…. You can never go far wrong by picking something by Alan Moore for a top ten list! Over the course of The Killing Joke, The Joker has escaped from Arkham, crippled Barbara Gordon and tried to drive the Commissioner insane, and now Batman has finally caught up with him in the Hall of Mirrors. But Batman doesn’t waste time running through mazes like a college rat he gets straight to the point. We don’t even see the punch but thanks to Moore’s superb writing and Bolland’s powerful art we can feel the power and the rage. Batman is following a lead to Metropolis and because he knows Superman lives there he packs his Kryptonite ring, the one thing that could actually kill the Man of Steel! That’s right - he has no reason to believe that there is anything wrong with Superman, nor any reason to believe that he will have to fight him, but he packs the ring anyway. Just in case. Of course, he’s Batman, so as it turns out he’s right and Superman does need a beating. Talk about forward thinking, eh? Must be hard, being friends with Batman. He’s probably got a spare Green Lantern ring kicking about in case Hal Jordan ever needs taking down again…. 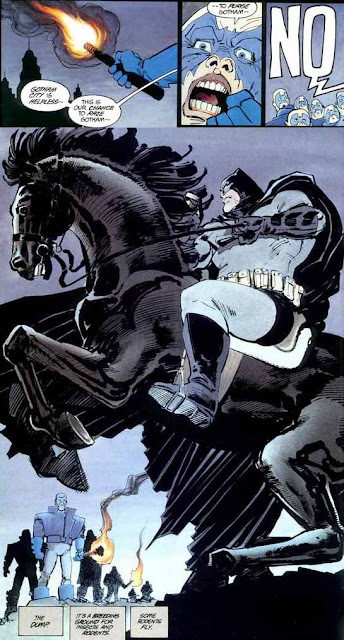 In interviews Frank Miller has said that the scenes with Batman on horseback are supposed to invoke an image of him as a hero from an earlier, simpler time, like the Lone Ranger or Zorro. And you certainly can’t argue with fantastic iconography like this and it was a tough choice between this scene and the later one with Batman charging towards the reader with lasso in hand. Working his way up from the streets to the people in power, Batman declares war on the corrupt fat cats who have allowed crime to prosper in Gotham. He waits for them to gather together at a party then takes out their bodyguards, blows a whole in the wall, and plunges them into darkness, into his element. 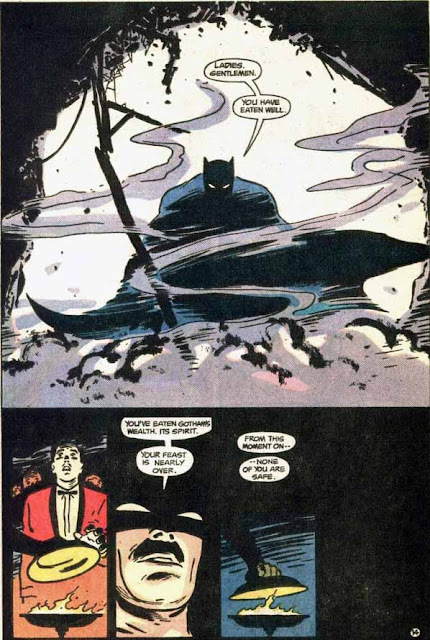 Once again Frank Miller shows that, in the days before Dark Knight Strikes Again and All Star Batman, he had a real handle on the character as he develops the concept of criminals being a “superstitious, cowardly lot” by having Batman intimidate Gotham’s movers and shakers. He doesn’t hit any of them, none of them get thrown out of a window or dangled off a fire escape, he just speaks to them - but they are just as terrified of him as any two-bit street thug would be. The JLA, including Superman, have all been taken down by the mysterious Hyperclan. Only Batman remains free and they believe he is no threat as he is “only a man”, but as Superman replies, “he is the most dangerous man on Earth!” What the Hyperclan don’t know is that the World’s Greatest Detective has worked out their secret – they’re actually Martians. And as such that means they’re vulnerable to fire. In just a few pages Grant Morrison nails Batman as a character much more completely than he has managed over the last couple of years in the main title. You don’t even see the fight, you don’t need to…… who needs the Justice League, Batman can save the world on his own any day! 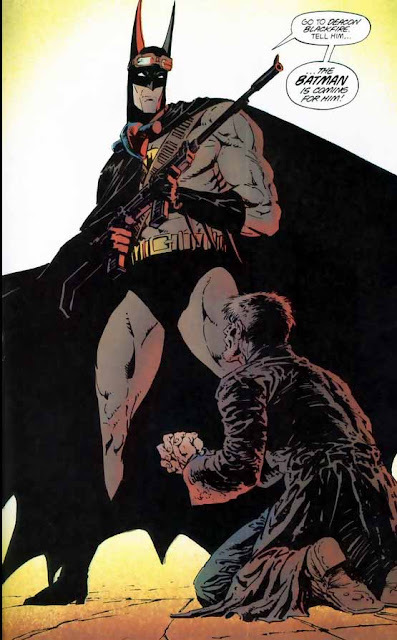 A second showing for Grant Morrison in the Top 5, this time from the very late 80s and the early days of Legends Of The Dark Knight. The evil Mr Whisper has Batman captured and incapacitated and, in true supervillain style, he sets up an elaborate death trap. Over the course of three tightly drawn pages Morrison details the kind of death trap that was a staple of Batman comics in the 60s…. and then subverts the whole thing by having Batman escape with ease – no tense dialogue, no elaborate explanation, he’s just free. Of course he is, he’s Batman! The dialogue is just the icing on the cake. I always knew a DKR moment would be Number One, but which moment? Well, what else could it be? 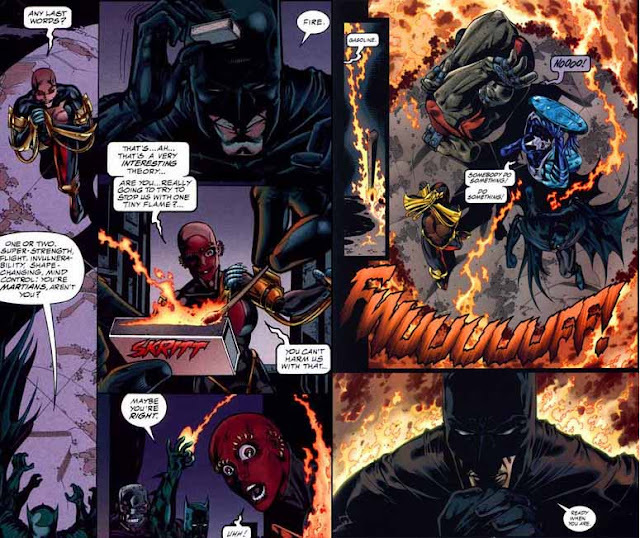 We see an old, angry Bruce enraged at what Gotham City has once again become; we see a furious assault on the criminals of Gotham and then finally we see the panel above. Batman back in costume, the Dark Knight returning and, in my mind, the greatest Batman moment ever! So that’s my favourite Top Ten, and believe me, it could easily have been a Top Fifty! So feel free to jump in and let us know your top moments.